As the fall wears on and many of the home projects are winding down…It’s cold out there!! It time to post a few horns for sale. 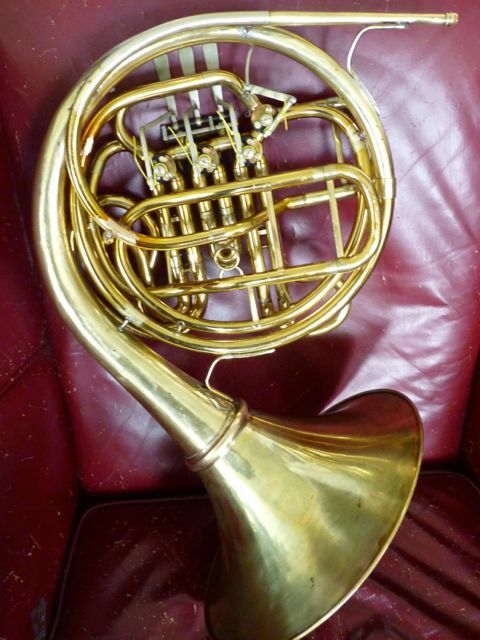 A nice screw-bell yellow brass King Fidelio/2269. Serial #1002XX Lacquer is stripped on the bell tail and flare and around areas where heat was applied for bell tail removal. Lacquer is somewhat blotchy on the F tuning crooks and has been removed on the main water slide. Very good fast valves with near excellent compression. Plays with that big open McCracken sound. Well centered and in-tune across Bb and F sides. All slides smooth. signs of minor dent raising back bow. I’ve added an Adjustable Pinky Hook and an Amado Water key. The nylon/ plastic change valve lever shaft has been replaced with a Chuck Ward metal replacement shaft. Stop plates are the king’s black composite with new cork stop bumpers. 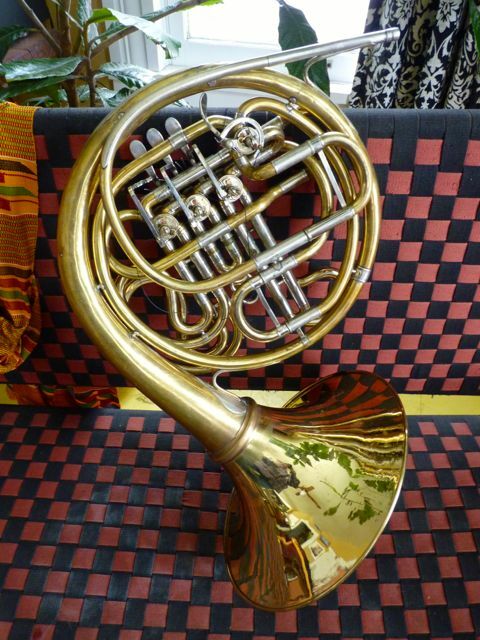 Excellent serious student or adult player that desires a medium bore yellow brass horn. 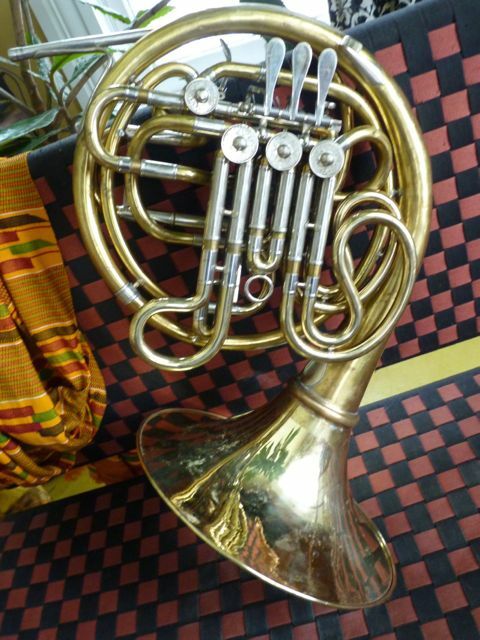 This horn plays very well…. Additional pix available, ask questions. Shipped in a fixed bell case in OK useable, but not new condition. Shipping box is 18 X 18 X 27 and weighs 21 pounds. 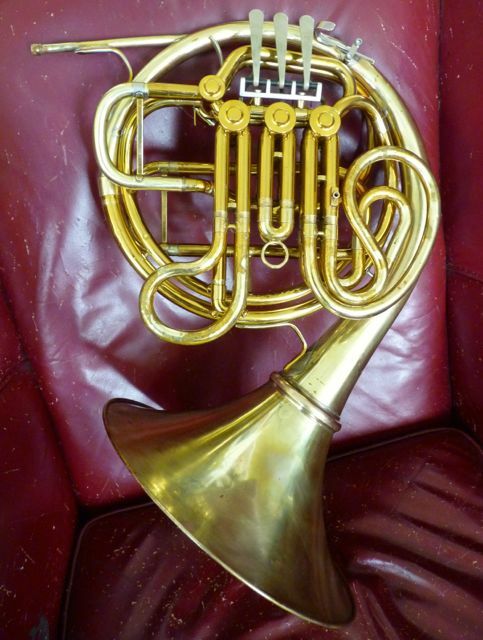 A early NiSi Holton 177. 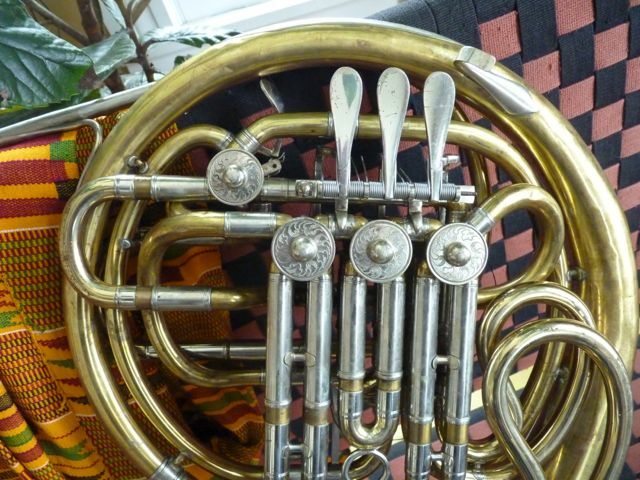 This is the original Farkas model with the European valves with the oil port. Serial number 484455. Detachable bell. The ring-set, installed later, is a Holton set. Plays very well in tune with a good sound throughout all ranges. A very strong lower range, with a good high range. 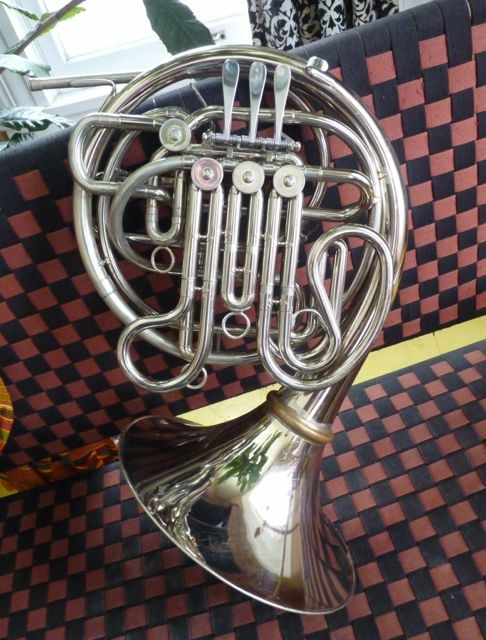 It has that well-focused sound from a medium bore horn. 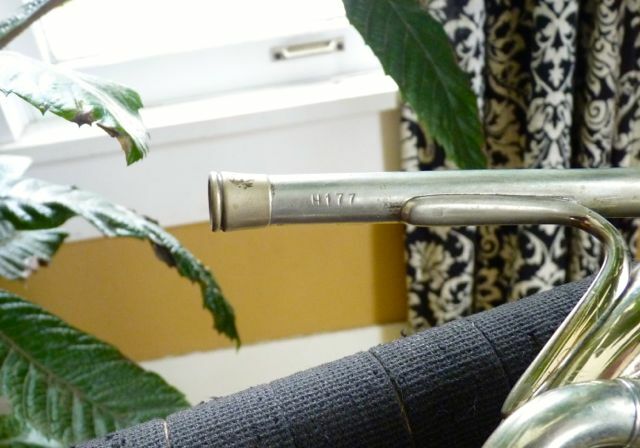 The original lead-pipe has been changed to a H177 pipe. There is a chance that this is an early H177 and they were still using the European valve parts as on the 77 model. 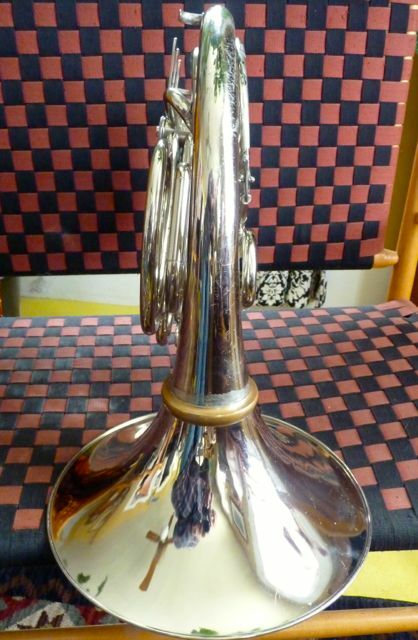 It is in very solid playing condition, but cosmetically challenged, this is not a drum & bugle corps shiny marching horn! It has been stripped of the lacquer in areas where work was done and has achieved a lovely patina over time. It has the factory water key. 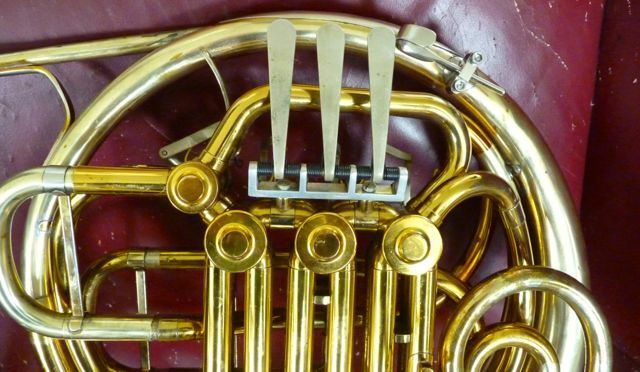 The valves have excellent compression. 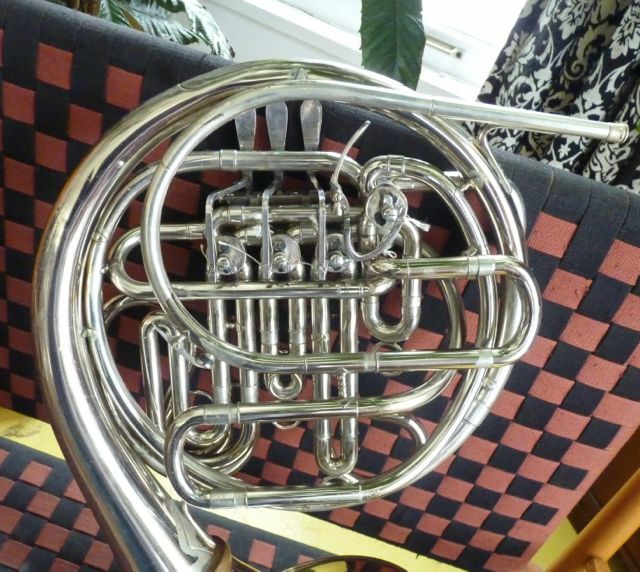 This is a good horn for a serious student/ adult who is conscious of space considerations, and is seeking a medium throat horn at a fair price. The case is the protec similar to the Conn detachable case. Pay Pal, checks, and money orders, OK. 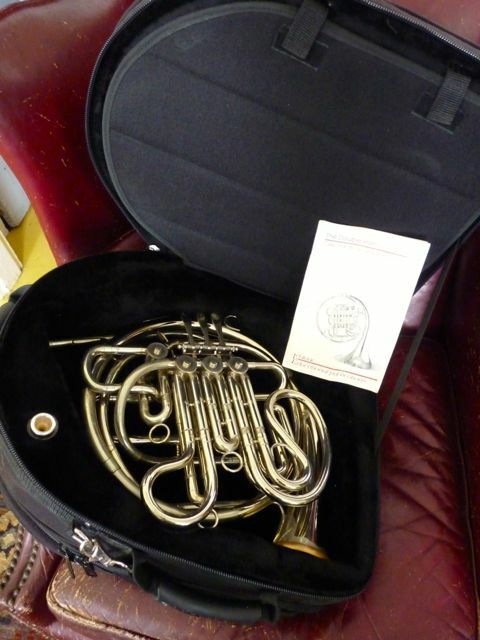 The instrument will be shipped within 48 hours following receipt of payment. Email questions. Buyer pays shipping based upon the USPS priority mail calculator to your zip code. @ 18 LBS 18X 18 X 24 “ box. 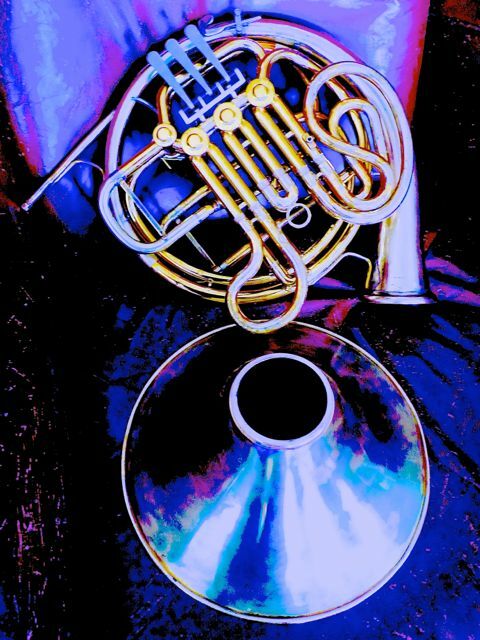 A Mirafone/Miraphone Germany Double French Horn. 12 1/4″ bell. .475″ bore. Serial # hidden under top 1/2 of ring set. ‘Made in Germany’ was engraved on the bell, which was removed due to extensive damage. 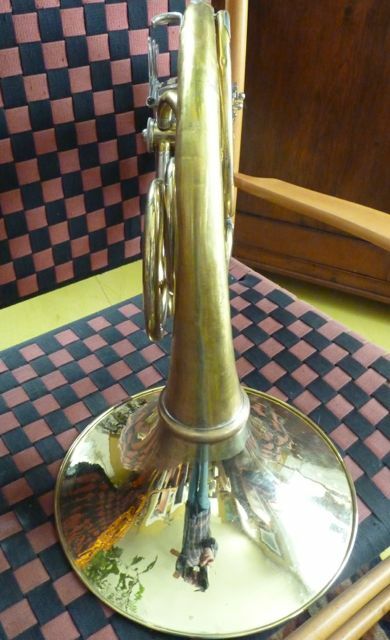 This horn’s original bell flare has been replaced with an european spun flare of the same thickness. which is lacquered in and out except where lost due to ringset work. There is evidence of solder brace re-solder work, mostly part of the screwbell process. The corpus has had the lacquer removed, Includes a useable hardshell case. The tonal color is exceptional. 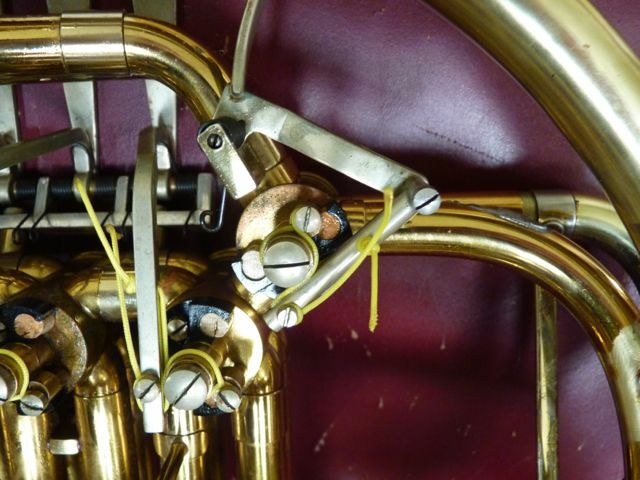 The valves have very good compression.